Comments Off on Bruins play a solid 60 minutes for a 4-1 Win over the Knights! Bruins play a solid 60 minutes for a 4-1 Win over the Knights! (Photo: Nick Sanderson, Ryan McConkey makes a save in the second period). The Bruins came out flying in the first period opening up a 3-0 lead as Robert Freckelton scored just 39 seconds into the game as he banged home a rebound from Aiden Reilly’s breakaway shot. It was Daniel Wu getting his first as a Bruin and in Junior C firing a rocket off of the glove of the Knight’s goaltender Spencer Green. Kyle Spataro and Carson Bell assisted. Michael Rennie stole a cross ice pass from the North Kawartha defenceman to end the first period 3-0 Bruins. Ryan McConkey turned aside all 11 shots he faced in the period. Freckelton got his second of the game from Kieran Beaudoin and Aiden Reilly to close out the Bruins scoring in the second period. The Knights got their lone goal in the third as the game ended 4-1 Uxbridge. Final Shots were 31-29 by North Kawartha. The Bruins are in Little Britain Sat. Sept.30th and their next home game is Oct.6th in a rematch with the Merchants. 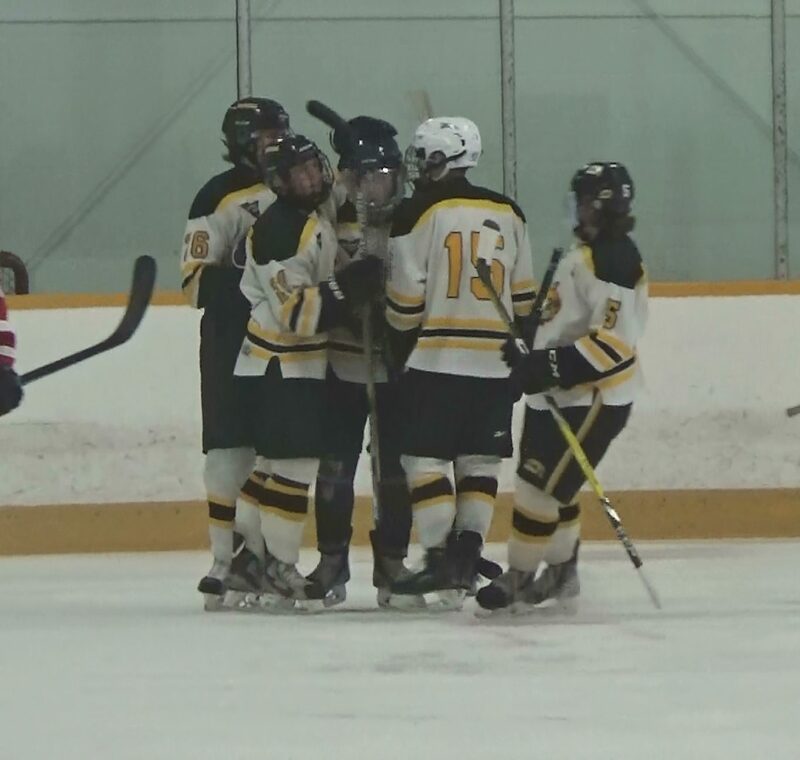 Comments Off on Bruins Defeat The Ice 7-1 at Keswick! Bruins Defeat The Ice 7-1 at Keswick! 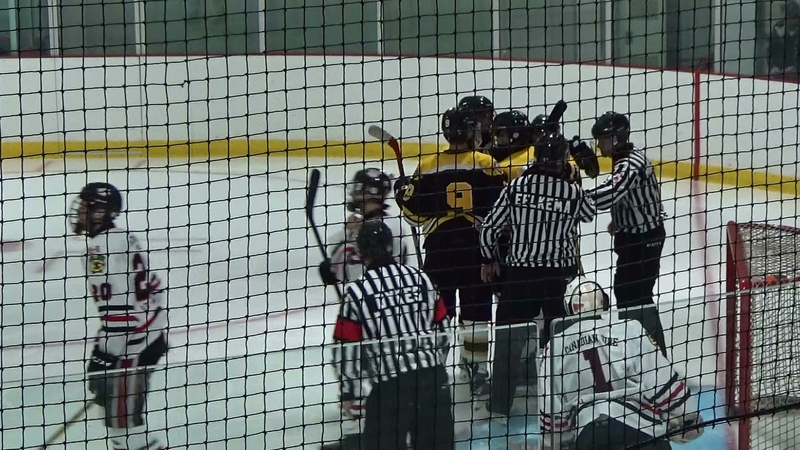 The Uxbridge Bruins played a disciplined game tonight and beat the Georgina Ice 7-1. Aiden Reilly started the scoring at 1:27 into the game and finished the scoring for the Bruins with his second goal at 16:52 of the third period. Carson Bell scored his first Junior C goal in the second period. Also scoring for the Bruins were Micheal Rennie with two (2nd goal video) , Derek Dolan and Simon Feig. 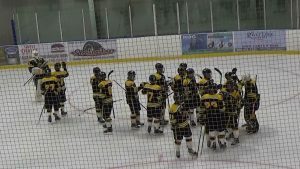 Georgina scored with under 2 minutes left in the game to keep goaltender Ryan McConkey and the Bruins from having their first shutout of the season. 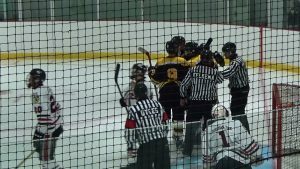 Comments Off on Bruins Get Hammered in Lakefield! 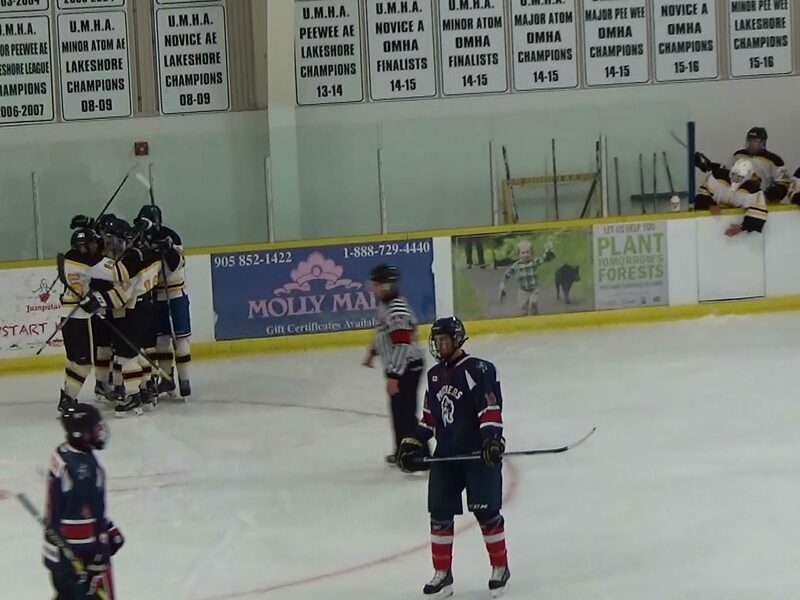 Bruins Get Hammered in Lakefield! (Photo: Peter Ovens, Bruins celebrate their 2nd goal of the game). 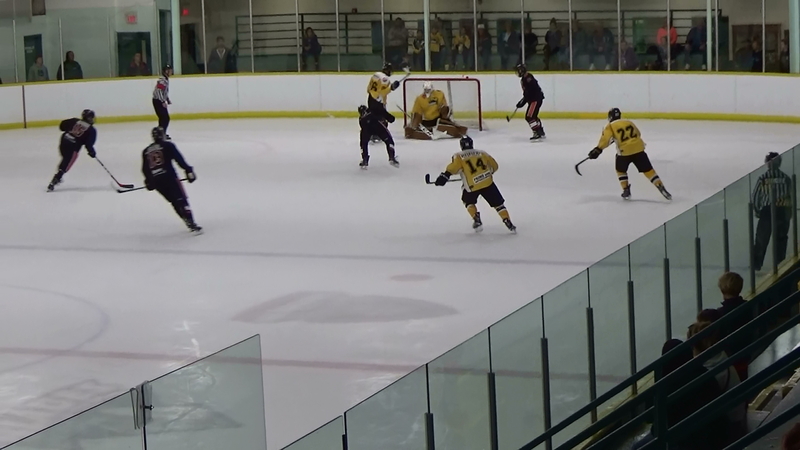 The Bruins quickly fell behind 5-1 in the first period tonight as they played their first road game of the season in Lakefield. Noah Donaghy with his first junior c goal was the only bright spot in this one as the Chiefs got 3 more for an 8-2 win over Uxbridge. Kieran Beaudoin picked up a goal in the second as it ended 6-2 Lakefield after two periods. Uxbridge is in Georgina (Keswick) on Fri. Sept.22nd to play the Ice. Comments Off on Bruins Win their Home Opener in front of 192 Fans! Bruins Win their Home Opener in front of 192 Fans! It was a fast paced first period as the Mojacks lead 3-2 after one, Simon Feig with the first of three on the night and Kieran Beaudoin picking up his first Junior C goal as a Bruin. In the second Uxbridge tied it and then took the lead on goals by Michael Rennie (his first junior c goal) and Feig. The Mojacks tied it though at four’s after two, out shooting the Bruins a combined 38-19. In the third Uxbridge got goals from Matthew Hunter (his first junior c goal), Derek Dolan and Feig who scored an empty netter to complete the hat trick. Final shots 53-33 Port Perry. Congrats to Coach Acton on his first Junior C win with the Bruins. Uxbridge is at Georgnia next Fri. Sept.22nd and then back in Uxbridge on Sept.29th. They play in Lakefield on Tuesday Sept.19th. For highlights click on player names. Comments Off on Bruins Lose Close Game Against The Panthers! Bruins Lose Close Game Against The Panthers! (Photo Nick Sanderson) Bruins Players celebrate Aiden Reilly’s goal. There were no goals in the first period tonight at the Bear Den as Port Hope out shot the Bruins 16-2 and several key saves by Uxbridge goalie Ryan McConkey kept them in the game. The Panthers opened up a 1-0 lead but Uxbridge came back and tied it on an Aiden Reilly tip from Adam Bartholomew’s point shot. Jake Joosten played the second half of the game in goal for Uxbridge and made a fine glove save in the third period as the final ended up 3-1 for Port Hope. Final shots were 47-22 for Panthers. Click on Player names for video. Uxbridge host the Port Perry Mojacks on Friday Sept.15th at 7:45pm at the Bear Den in their home opener to start the 2017/18 season. We hope to see you there. Comments Off on Uxbridge Dominates Little Britain 9-1! Uxbridge Dominates Little Britain 9-1! 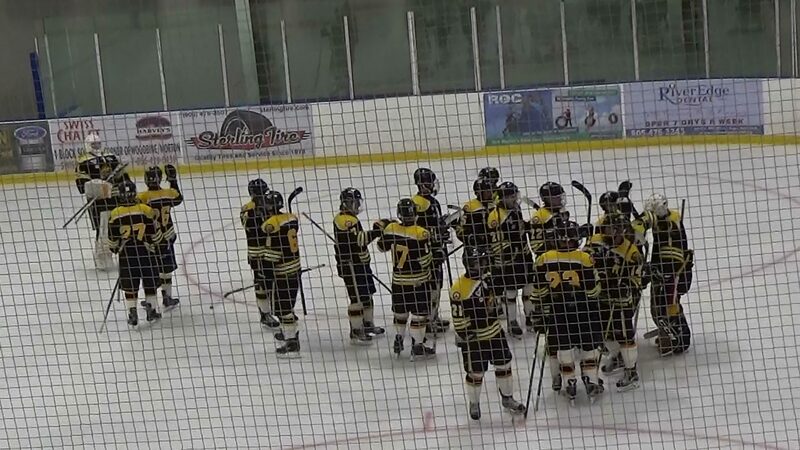 (Photo Peter Ovens) Bruins celebrate one of many goals tonight. The Bruins fired 17 shots in the first period scoring two goals by Rennie and Sribny holding the Merchants of the shot clock, a rarity in the game. In the second it was Sribny, Beaudoin, Dolan and Danforth for a 6-0 lead after two periods. Sribny completed the hatrick as Beaudoin got his second on the night with McKenzie closing out the scoring. Final shots were 51- 9 Bruins. Next up Port Hope visits the Bear Den to close out the exhibition season Friday Sept.8th at 7:45pm.